Weather Report : Blog Of The Nation Some uncharacteristically cool Washington weather. Come June, this city gets unbearably hot and humid. We walkers keep spare shirts in our backpacks. On Capitol Hill, staffers sport Seersucker. And everyone wonders how Washington, which is surrounded by water, never benefits from a cool breeze. Last night, on my way home from work, we had a rare meteorological miracle. West of the capital, a thunderstorm threatened. Toward Annapolis and the Chesapeake, the sky was bright and blue. For a few minutes, Washington was cool and sunny. There were fits of light rain. 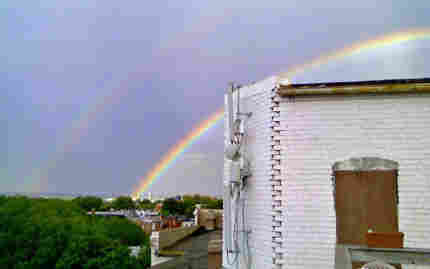 And around 6:15 p.m., two huge rainbows spanned the city. I snapped this photo, from the roof of my building, at 6:22 p.m.